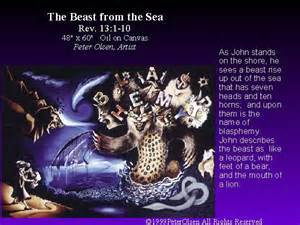 The Rise and Reign of the Beast and the False Prophet, The beast out of the sea: the deadly wound healed. 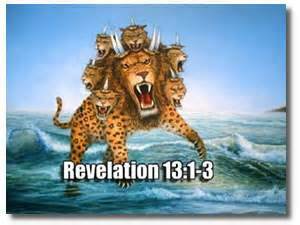 This Chapter of the Book of Revelation is to many folks one of the scariest and most misunderstood chapters in all the Bible. Well, the main reason is that people (including preachers and ministers) who are unfamiliar with the Word of God and the plan of God try to interpret what it says. Since they are completely unfamiliar with the symbology used to create a PICTURE to make things clearer and illustrate what's happening, they must make up stories out of their own imaginations to try and explain that which completely baffles them. And that's really scary, for that which one who claims to be a teacher or preacher says to God's children, affects their very lives and even their souls. It is a serious matter. But for those who do have eyes to see and ears to hear, who are familiar with God's Word, and even for those who have followed along with us in this Book of the Revealing from the beginning, this chapter is easy, as you will see, because we have seen and read of it all before. 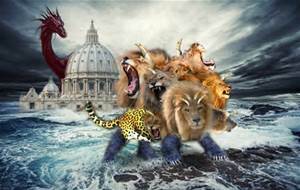 As an overview, we will encounter two "beasts" in this chapter, the descriptions of which will give us a PICTURE of the Political and Religious systems, two of the Four Hidden Dynasties, in their full flourishing, that Satan uses to deceive the whole world. Before we even begin to try understand the symbolism used and what these verses mean, let's make sure we SEE the PICTURE. (Note: You can often acquire artist's conceptions of this beast at various phone booths around the country.) Well phone booths have pretty much become a thing of the past. But you still see some of those little booklets laying around, from time to time. So what do we see? There's a great beast, a ghastly monster if you will, who rises up out of the sea. And he has seven heads! Wow, seven heads! I don't know of any real animal or beast who has seven heads, do you? And he has ten horns with crowns on them! What a weird looking creature, but very intimidating! And look! He also looks like a leopard with bear's feet and lion's mouth. He's an awesome, terrible looking thing. In fact he makes Godzilla look like a beauty contestant. Remember Rev. 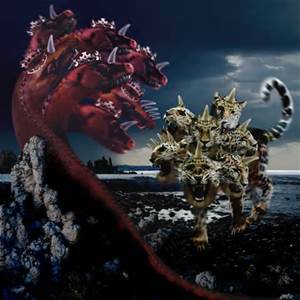 12:9 "And the great dragon was cast out, that old serpent, called the Devil, and Satan, which deceiveth the whole world: he was cast out into the earth, and his angels were cast out with him." Now let's look at the symbolism used in the PICTUREs you just saw. Remember also that we saw this same description of this same power structure of the dragon in the first earth age in Rev. 12:3, except that he will have 3 more "crowns" with him this time when he gets here. These ten kings will be present during the reign of the false-christ, Satan, during that great hour of temptation. Are the ten kings ten leaders of countries today? Probably not. In so far as they were present in the first earth age, they will most likely accompany Satan as part of that entourage of angels who are cast out with him. They will reign over, i.e. divide up, the whole world, all seven continents. 5.) And what about the leopard, bear, and lion? 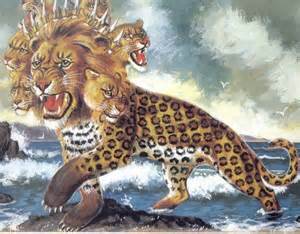 We could spend several days studying the attributes of these three "beasts" and their usage in the Bible. 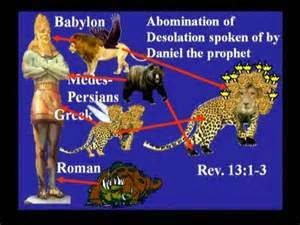 You should read all of Daniel chapter 7 where you will find the leopard, the bear, and the lion all identified as separate beasts before the final beast with ten horns rises up and takes over. 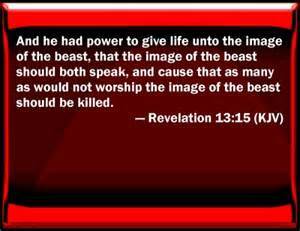 Here in Revelation, though, we see that final beast, and he possesses the most outstanding attributes of each of these carnivorous, flesh eating, animals. The leopard is cunning and swift whose spots cannot be changed (Jer. 13:23). This should also bring to mind the fact that "their spot is not the spot of His children" of Deut. 32, the Song of Moses, which we will soon see the overcomers singing in Rev. 15. And the bear? His powerful feet are able to crush and break in pieces as the one world system can do. And mouth of a lion? The mouth contains the lion's teeth which rip and shred and tear and devour. 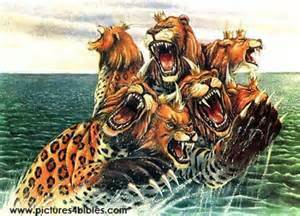 Remember we read of Satan's "locust army" who also had the teeth of lions? But there's no need to fear these attributes of Satan's political system. Though it might appear to us as a giant beast we're not afraid of Goliaths or multi-headed beasts, or scorpions, or locusts, etc. We have power over them (Luke 10:19) . How about that David? Hmmmm. Would seem that the New World Order has a problem keeping its heads on straight. One of them takes a lethal blow to the skull. But not to worry, his deadly wound is all patched up. There, there. Any guesses as to who heals it? Note: I thought I told you not to guess about God's Word. If you want to look ahead to verse 12 you will see that Satan himself, the supernatural archangel coming as Jesus Christ, heals the deadly wound. No problem for Slick Satan. Now, for those who like to speculate as to what the deadly wound will be to the New World Order, here's a type set forth in history by the predecessor to the United Nations, The League of Nations, formed during President Wilson's term (he also gave us the Federal Reserve System). The League of Nations received a deadly wound and it died, for it could not settle an international dispute. It was replaced in 1946 with the United Nations, another attempt at a powerful enough world organization that could try to force nations to remain at peace. How is it going in the middle-east these days? Now there's a surprise! They worshipped the dragon! Everyone should be totally "up to speed" by now on who this dragon dude is. How is it that the world worships the dragon? They believe he is Jesus Christ! And he, the dragon, heals the deadly wound and does bring about world peace and a One World Political System. And who is able to make war with him? My goodness, they say that now! I've heard the statement several times on talk shows: "Who is able to go against the wishes of the international community?" Not too many years ago, then United States President Clinton even said it in his State of the Union address regarding Saddam Hussein. How much more true it will be when Satan comes! Turn on your radios and television sets and listen to what is being said. Then go read 1 Thessalonians chapter 5. No one, not even the apostle Paul, should have to tell you what season we're in! That means while one is sleeping. We're not! Got your radio on? The locusts are coming soon! And the dragon with them! Right after the NWO takes a hit! It's the next benchmark in Bible prophecy! Do you realize how much more exciting things will be shortly? Why? 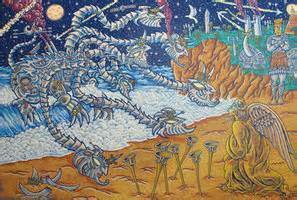 We get to face the Dragon and his locust army! But having come this far, wouldn't you agree that the Book of Revelation is actually very easy to comprehend? Once we take the time to understand the symbolism that the Holy Spirit uses to paint vivid pictures for us, the meaning becomes self evident. Often it just requires the application of common sense more so than "doctoral like" scholarship. Earlier we learned that the old serpent, the dragon, is actually Satan himself. And we discovered in Rev. 12:7-9 that soon Michael will cast him and his army of angels out of heaven and to this earth. "Woe to the inhabiters of the earth", remember? There will be spiritual warfare such as never was nor ever shall be again! So, let's continue our study of the revelation of the "Acts of the Dragon" in Rev. 13:5. And what a BIG MOUTH he has! Satan can do NOTHING except our Father allows it, though he thinks he can. This Big Mouth Dragon also suffers from a severe case of self delusion! We also noted in chapter 12 that all prophecy pertaining to Satan and his own is given in "lunar" terminology since they are of the "night". But God's children walk not in darkness, but are children of the "day", i.e. light, and so prophecy pertaining to them is given in "solar" terminology. Here Satan, the chief "lunar-tic", is allowed 42 months (moons) to do his thing. Of course we know that Jesus overrode this time period and shortened it, else no flesh would be saved. Mark 13:20 "And except that the Lord had shortened those days, no flesh should be saved: but for the elect's sake, whom he hath chosen, he hath shortened the days." We learned in Rev. 9 that the shortened period is 5 months, the time of the swarming locusts. Many people when they read these last two verses imagine that the dragon, Satan is going to say evil things against God. But he's not going to be speaking "bad things" about God. He's going to be speaking AS GOD, i.e. everything that comes out of his mouth is blasphemous because he is claiming that HE IS GOD. That's the blaspheme! Remember what Paul told us would happen BEFORE our gathering back to Christ? The "falling away" is the great apostasy which we will read of in a few verses in Rev. 13:8 whereby the whole world worships the dragon, the son of perdition, the son who will perish, i.e. Satan, because of the next verse in 2 Thessalonians. There is your blaspheme of Rev. 13:6! Blaspheme of God's "name and His tabernacle and all that is in heaven". Satan sits in the temple of God claiming to be the Messiah and all those Christians who didn't have enough oil in their lamps, i.e. were Biblically illiterate and were not sealed with the knowledge of His Word, are bowing to the dragon, worshipping Satan, believing he is Jesus! The dragon is really good at deception. Just wait a few verses and we'll see him perform "miracles" to dazzle the troops! Do you recall from the last few verses of chapter 12 that Satan comes after the woman's remnant, God's elect? He declares WAR on them! He's angry with them and he hates them! Rev. 12:17 "And the dragon was wroth with the woman, and went to make war with the remnant of her seed, which keep the commandments of God, and have the testimony of Jesus Christ." How does Satan overcome the saints? Real simple. He causes them to be delivered up to councils and placed on trial before the world. Christ foretold us this. He has foretold us all things! But remember, not one hair on their heads can be harmed (Luke 21:18). Beaten means the same thing as "he overcame them" or let's say they shall be "brow beaten". Satan is not going to publicly physically beat people on worldwide TV. He's too smart for that. After all, he's the number one "liberal leftist" in the world and they believe in rehabilitation (conversion) not corporal punishment. And don't forget he's claiming he is Jesus Christ, King of kings and Lord of lords, the ruler of the whole world with power over all kindreds and tongues and nations. And all the world believes this imposter! There it is, the Great Apostasy! If you don't know ahead of time that there are two Christs, if you don't understand 2 Thes. 2 and the 7 Seals real, real good, then you will worship Satan as Jesus. You see, from Ezekiel 28 we know how beautiful and marvelous and wonderful and charismatic this guy really is! And from Daniel we know he enters in peacefully and prosperously with a booming economy, meaning big bucks for everyone ("It's the economy, stupid!")! And from the previous chapter in Revelation, chapter 12, we know that he drew a third of God's children away from God in the first earth age! Folks, he's really, really good at swooning people! They just love him to death (both figuratively and literally)! 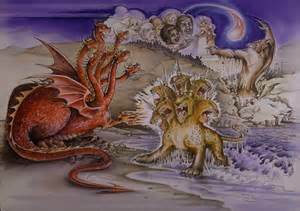 We learned concerning the dragon, Satan, that "all that dwell upon the earth shall worship him, whose names are not written in the book of life of the Lamb slain from the foundation of the world (Rev. 13:8)." Then we were told in the very next verse that "If any man have an ear, let him hear (Rev. 13:9)". So the obvious question must be asked? This is an important question because the very nature of the question itself lets us know by implication that there are those who don't have them, right? Therefore, there are two types of people who will read the rest of this 13th chapter of Revelation. Those who have "ears to hear" and those who do not. Those who do not, cannot "see" or "hear" past the flesh level and cannot understand that the tribulation is a battle for their soul, not their flesh. 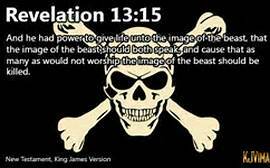 When they read "kill with the sword" they think about their flesh, despite the fact that we are told in Rev. 1:16 that the "sword" is the Word of God. When they read of "famine" they think about their bellies, despite the fact that Amos 8:11 tells us that the famine of the end times is for the hearing of the Word of God. In fact they love to hear preachers. in our so-called Christian churches, tell them how they are going to "fly away" in the clouds to save what? Their souls? NO! They say you must be saved to be "raptured". What then? To save their flesh! Does the Rapture Theory have anything to do with other than saving their little old flesh hides? Think about it. 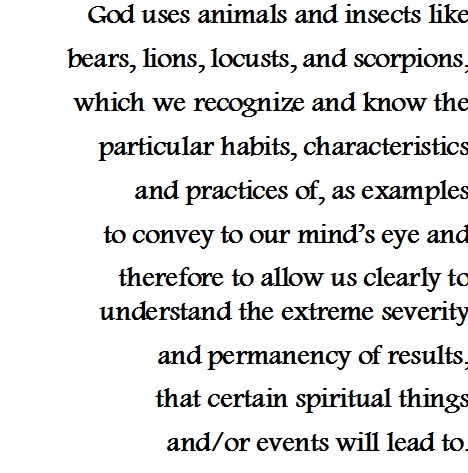 Did Paul tell us in Eph. 6 to put on the gospel armour to fly away or to take a stand? Even our Christian soldiers when they go off to war ask God to protect them on the front lines. They don't ask Him to fly them away so they can watch the battle from a remote place of safety. Arrrggg! Is the Bible a book about saving your flesh or "your soul"? Should we be worried beyond that which is the instinct of natural preservation about our bodies, which are going to wither and die ANYWAY! This next verse in Revelation continues with the "destiny" which we just read in verse 8, just prior to the "If you can understand". Rev. 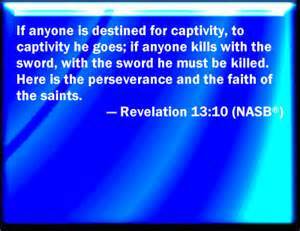 13:10 He that leadeth into captivity shall go into captivity: he that killeth with the sword must be killed with the sword. Here is the patience and the faith of the saints. This verse contains a Hebraism, again showing destiny (read Jer. 15:2), which the KJV doesn't bring forth all that well. Remember again verse 8. You are going to be "captive" to either the dragon or the real Jesus Christ. IF you understand the destiny then you are "marked" for one or the other, aren't you? In other words, you either have the Seal of God in your forehead whereby your name is written in the Lamb's book of life, or you have the Seal of Satan in your forehead, whereby you'll worship the dragon. So who holds your soul captive? If your name is written in the Lamb's book then you have the patience and the faith to endure unto the end. Now, remember when we began chapter 13 we said there are two "beasts" described in this chapter? 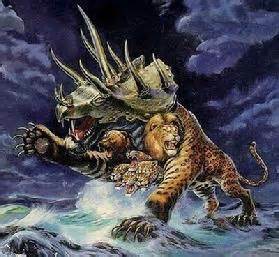 Well here is the second beast (different from the "first" as shown in verse 12), who is the religious beast. This PICTURE is nothing more than another profile of the dragon coming out of the pit, i.e. Satan. Rev. 13:11 And I beheld another beast coming up out of the earth; and he had two horns like a lamb, and he spake as a dragon. What are the two horns (powers) of the Lamb? Jesus Christ, the Lamb of God, is the (1.) King of kings and (2.) Lord of lords. He wields both the Rod and the Scepter. He's both World Ruler and High Priest. Satan's imitations of Jesus are described to us as blasphemous, venomous beasts. 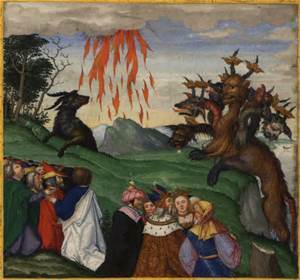 So this verse is another PICTURE showing us that Satan comes disguised as the Lamb of God, speaking blasphemes as the dragon, because he is the dragon. He utilizes to the fullest extent the "first beast", which is the one world political system, which he healed, put back together, and made into the "new and improved" New World Order, which he heads. And he will have the world like obedient dogs "licking out of his hand". Check out the word "worship" in Strong's. proskuneo, pros-koo-neh'-o, Greek 4352; from Greek 4314 (pros) and a probably derivative of Greek 2965 (kuon) (meaning to kiss, like a dog licking his master's hand); to fawn or crouch to, i.e. (literal or figurative) prostrate oneself in homage (do reverence to, adore) :- worship. The Greek word "fire" is pur Greek 4442; a primary word; "fire" (literal or figurative, specially lightning). This guy is really good! That's why Jesus shortened these days. Satan can snap his "pinkies" and lightning falls from the sky. Get ready! He will be spectacular! How does he deceive the people, them that dwell on the earth? By means of those miracles, one of which we just read of in verse 13. Snap, snap. And the people will "snap to it". And he gives new life to the NWO. Satan's one world political and religious system will be Bigger than Life itself and what it says goes! And if you don't participate you're dead meat, marked for the kill brother! (spiritual kill, that is!) 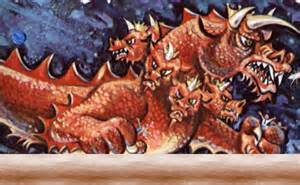 The dragon is coming after you snorting "fiery darts" spiritually speaking!. Are you going to "fly away" or stand and chop his head off? They will ALL be his "right hand men and women", yes, obedient little sheep! They are his "captives" remember? They will just love him! They will do his bidding which is what "to receive a mark in their right hand" means. It is a figure of speech just like I used "right hand man". It has NOTHING TO DO WITH THE RIGHT HAND, it's ALL ABOUT SERVICE. What did we read in verse 8? 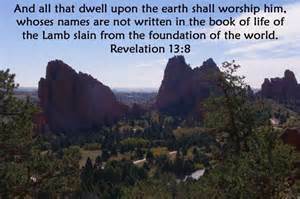 All those whose names are not written in the book will "worship the dragon, Satan, the religious beast". They will SERVE him as Lord! Note: There is so much ignorance regarding God's Word for the lack of understanding figures of speech. I said before that if in the Book of Acts we found a verse that read "The apostle Paul got into hot water", there would be churches that would require members in good standing to get into a pool or tub of hot water. The scholars would discuss how much water they should get into and just exactly what degree of temperature crests the threshold from "warm" to "hot". They would cite Strong's concordance which would say that "water" means the wet stuff H2O as coming from a lake, river or the sea. But the figure of speech "he got into hot water" means he "got into trouble" and it has NOTHING TO DO WITH WATER! Do you have wisdom or not? (1.) You either have the Seal of God in your forehead, in which case Satan can't touch you. (2.) Or, you have the Seal of Satan in your forehead, in which case you'll do his bidding and worship him. Oh, did I mention you are destined for one or the other? Here's something else to consider. If you don't know something then you don't know that you don't know it! That's a definition of deception. What is the mark? It's his "seal" in your forehead, i.e. you are one of his, you carry his stigma. What is "the name of the beast"? It's blaspheme, remember? He will say his name is Jesus, but he is the son of perdition. What is the number of his name? 666 not 888. He's Satan not Jesus. Do you "have his number"? In other words, if you are not a member of "the party", the NWO and his Congregation, you'll have much difficulty in commerce. So as a physical example: How did those who were not members of the Nazi party make out in Hitler's Germany? But, as a spiritual example and it is what's spiritual that is important throughout eternity: Read this Live Link to->> What did Jesus tell the folks from Laodicia to buy and sell? Once Satan arrives here in person, claiming he is God, you will no longer be able to find gold "spiritual gold" (The Word of God, i.e. a accurate version of the Bible), that has been purified in the fiery furnace, much less buy it. Do you remember how Satan altered scripture to seduce Eve in the "Garden of Eden"? Well it is already being altered and he isn't even here, in person yet! Right now his Kenite descendants are working on his revised version of scripture with only his spiritual influence to guide them! Oh, you'll be able to buy and sell bibles, but the accurate "Word of God"; that will be a thing of the past! Tell ye your children of it! Let your children tell their children! And their children another generation! This is so simple if you have eyes to see and ears to hear. You must first understand the verb "count" and then the understanding will appear wherein the wisdom lies. psephos, psay'-fos, Greek 5586; from the same as Greek 5584 (pselaphao); a pebble (as worn smooth by handling), i.e. (by implication of use as a counter or ballot) a verdict (of acquittal) or ticket (of admission); a vote :- stone, voice. It simply means to "enumerate using pebbles that have been worn smooth over a long period of time". This number of the beast, Satan's number, has been present for a long time, even from the beginning when the first mark was placed on the first one with rocks in his head, Cain. unless you know who they are! And you can trace Cain's descendents, who are the tares of Mat. 13, the vipers Christ addressed in John 8, i.e. the kenites, throughout the Bible and throughout history from the garden of Eden to present day. Have you read this book? And it all fits with the Biblical numerics of 666. 600 = Warfare, 60 = Idol worship, and 6 = man, evils of Satan. Reference "Biblical Mathematics", Ed. F. Vallowe. And have you looked up 666 in Strong's? chi xi stigma, khee xee stig'-ma, Greek 5516; the twenty-second, fourteenth and an obsolete letter (Greek 4742 (stigma) as a cross) of the Greek alphabet (intermediate between the fifth and sixth), used as numbers; denoting respectively six hundred, sixty and six; six hundred sixty-six as a numeral :- six hundred threescore and six. What is a stigma? It is as Strong's defines it "(figurative) scar of service" which is precisely as Webster has it "a mark of shame or discredit". So, do you carry his "stigma"? Are you stigmatized with the traditions of men? Do have the mark of the beast "in" your forehead where the brain resides? One last comment. Are you familiar with the Song of Moses which we've already mentioned several times is sung by the overcomers in Rev. 15, which we will soon study. If you read Ezek. 28 you'll discover that Satan is called the king of Tyrus, which in Hebrew means "rock". How many different ways must we be told, how many vivid PICTURES must we be shown until we understand that there are two lambs, two Jesus Christs, yes there are two rocks. So the question is: If you are not familiar with the Song of Moses, then how are you going to know it to sing it? Huh? You won't, because you wouldn't know one pebble from another. So you'll be counted out! Christ will say as it is written "Get away from me, I never knew you." Live Link to- Lets take a look at Cain and his children throughout the scriptures. Live Link to- "The Song of Moses"
To study the Bible is the noblest of all pursuits; to understand it, the highest of all goals.We pray that with the guidance of the Holy Spirit, you accomplish both.